John 10:14-15: I am the good shepherd; I know my sheep and my sheep know me - just as the Father knows me and I know the Father - and I lay down my life for the sheep. Heavenly Father, you are wonderful and generous beyond description. You have revealed your love by sending your Son to be my Shepherd. Help us hear his voice through your Word. Help us hear his voice through the wise counsel of spiritual friends. Help us hear his voice in the Holy Spirit's work on our conscience. 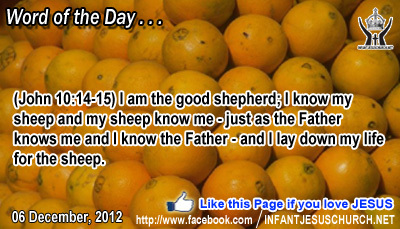 Father, we want to follow your Son as our Shepherd and Lord because we know he, like you, is good! In the name of Infant Jesus we pray. Amen. 21"Not every one who says to me, `Lord, Lord,' shall enter the kingdom of heaven, but he who does the will of my Father who is in heaven. 24"Every one then who hears these words of mine and does them will be like a wise man who built his house upon the rock; 25and the rain fell, and the floods came, and the winds blew and beat upon that house, but it did not fall, because it had been founded on the rock. 26And every one who hears these words of mine and does not do them will be like a foolish man who built his house upon the sand; 27and the rain fell, and the floods came, and the winds blew and beat against that house, and it fell; and great was the fall of it." There is only one way in which a person's honesty can be proved, and that is by one's practice. Fine words can never replace good deeds. Our character is revealed in the choices we make, particularly when we are tested. Do we cheat on an exam or on our income taxes, especially when it will cost us? Do we lie, or cover-up, when disclosing the truth will cause us injury or embarrassment? A true person is sincere and reliable before God, one's neighbor and oneself. His or her word can be counted on. If we heed God's word and live according to it then we need not fear when storms assail us. God will be our rock and your refuge. Is our life built upon the sure "rock" of Jesus Christ and do we listen to his word as if your life depended on it? Loving Infant Jesus, you are our Rock and our Refuge. Help us to conform our life according to your word that we may stand firm in times of trouble and find hope in your promises. There is only one way in which a person's honesty can be proved, and that is by one's practice. Fine words can never replace good deeds. Our character is revealed in the choices we make, particularly when we are tested. Do we cheat on an exam or on our income taxes, especially when it will cost us? Do we lie, or cover-up, when disclosing the truth will cause us injury or embarrassment? A true person is sincere and reliable before God, one's neighbor and oneself. His or her word can be counted on. If we heed God's word and live according to it then we need not fear when storms assail us. God will be our rock and your refuge. Is our life built upon the sure "rock" of Jesus Christ and do we listen to his word as if your life depended on it? Loving Infant Jesus, you are our Rock and our Refuge. Help us to conform our life according to your word that we may stand firm in times of trouble and find hope in your promises.